It’s summer time in the lower Florida Keys. The year is 1994. The sun has hid its face, and yours truly is spending a gorgeous night in a bright orange tent just off the beach. The sound of the nearby waves soothe my soul; filling me with a kind of inner peace I’m not accustomed to in Tennessee. The stars this night seem to be in the trillions! And I am praying this day never ends. It has been a long journey to get here. Suffering from jet lag and a crowded bus ride from Fort Lauderdale, I decide to call it a day. Breathing in deeply, taking in the salty air, I soak in the beauty that is before me; trying to engrave the image into a lasting memory. With my gear stowed, I find my place in the tent and close my eyes. The sounds of men and boys talking and laughing keep me from drifting to sleep. So I lay in amazement at the thought of how a poor boy could be so lucky to be here…now…in this place. There’s a deep swelling of emotions as I realize there is much more to come on this trip. But the thoughts are pushed out of my mind as I begin to take notice of how bright the sky is. And soon I see why. 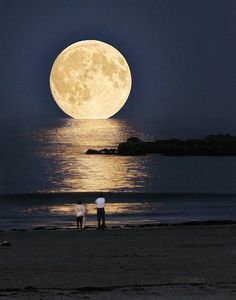 Across the mass of water that is the Atlantic, and blessing us with a head on view of all of its glory, the moon rises out of the ocean. But this wasn’t any ordinary moon like I have ever seen. No. This was the grand daddy of them all! The largest and brightest moon I have ever seen, and have ever seen since, floated slowly into the sky as a god returning gracefully back to it’s kingdom. I simply could not believe what I was seeing! Without realizing I did it, I made my way out of the tent and walked closer to the shoreline. There I stood in sheer awe at the sight the filled my vision. There are those moments in our lives when we have the opportunity to witness something truly magnificent. They are when time slows to a crawl, the worries of the world become meaningless and you realize just how insignificant you really are. It’s a feeling we all know – an experience the dictionary can not describe. But when it reveals itself to us it stops us in our tracks. All you can do is simply be. My Boy Scout trip to the Sea Base that summer changed my life. I have never been the same since. But it’s a good change! And one that I hold onto dearly. Posted on August 8, 2015, in Kyran Ravencroft and tagged Boy Scouts, Florida Keys, Full Moon, Sea Base. Bookmark the permalink. Leave a comment.